Chip maker VIA has introduced the new OpenBook reference design for low cost, light weight ultraportable laptops. The company’s earlier Nanobook reference design was the basis for a number of ultraportables, the most recognizable probably being the Everex Cloudbook. So it’s not that surprising to see that the previously announced Cloudbook Max (due out in 2009) will be built on the OpenBook reference design. 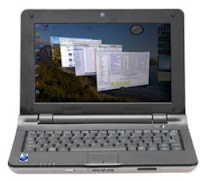 The reference design uses open standards and some aspects are even being released under a Creative Commons license which makes it easy for computer makers to customize the look, feel, and specifications of the units. So while we may see a small flood of computers that look like the Cloudbook Max, you could also see some computers using the reference design that look a little different. It’s not clear whether PC makers will be able to replace the C7-M processor with a shiny new VIA Isaiah processor once VIA releases the low-power successor to the C7-M. But I’m going to make a wild guess and say yes. Or at least probably. Or maybe. While I’ve got my prognostication hat on, I’m also going to guess that more Asus Eee PCs will be sold in the next year or two than all the OpenBook-based computers combined. You know, unless HP, Dell, or Acer decides to use the VIA reference design. But overall, the C7-M CPU just doesn’t offer the performance you can get from an Intel Celeron chip, let alone the Intel Atom. Update: Engadget has some hands-on photos of an OpenBook prototype. Hmm. Open source hardware design and open source operating system. Sounds like a good idea. Microsoft may wind up losing the ULPC market to Linux, especially if they insist on making people buy an unwanted OS, Vista, in order to “downgrade” to XP. Although it appears that the Wind may be coming with XP preinstalled. See the report at Msiwind.net for a recent review and benchmarks from someone who got a Singapore model.